I Pappou, J Irvine Jr., A Dacus. First Through Third Carpometacarpal Dislocation Variant With Trapezoid Dislocation And Trapezium Fracture. The Internet Journal of Hand Surgery. 2012 Volume 3 Number 2. We describe a novel carpometacarpal (CMC) injury pattern of the 1st through 3rd rays with a thumb CMC dislocation, minimally displaced trapezium fracture, trapezoid dislocation and 3rd CMC dislocation. The injury was promptly identified and correctly characterized. Anatomic reduction and internal fixation for an appropriate time period allowed for soft tissue healing and a good short term outcome. We review the pertinent literature to carpometacarpal dislocations and contrast it to the presented case. Thumb CMC dislocation has not been previously reported in association with dislocations of the other rays. After a thorough review of the literature and the reported patterns we report a novel fracture dislocation variant of the first through third CMC joints: a thumb CMC dislocation with concomitant minimally displaced trapezium fracture, trapezoid dislocation and 3 rd CMC dislocation. A 60 year old, right hand dominant man was hit in the head by a tree while working in his yard and landed onto his hand, unsure of the position of the hand during impact. Upon arrival to the ED from an outside hospital, he was found to have a swollen and tender left hand with obvious deformity in the CMC area. His hand was warm, well perfused and motor function/sensation was intact in the median, ulnar, and radial nerve distributions. Associated injuries were head lacerations, bloody nares, skull fractures and pneumocephalus. Plain radiographs revealed the above described injury (Figure 1). Additional imaging (fluoroscopy in the ED and a CT) further delineated the injury (Figure 2). Plain views of the injury. The trapezium fracture is poorly visualized due to overlap. 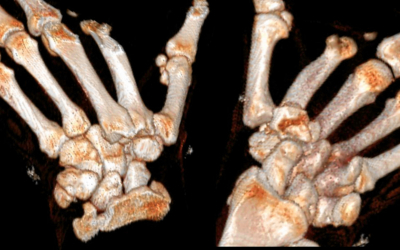 The trapezoid dislocation, thumb CMC dislocation and trapezium fracture can all be well appreciated on the 3D CT reconstruction. Attempts at closed reduction were unsuccessful. After clearance by neurosurgery he was taken to the OR for closed versus open reduction and percutaneous pinning. Intraoperatively, the trapezoid dislocation was reduced first, which effectively reduced the third CMC dislocation and was held reduced with K-wires. The 1 st CMC was subsequently easily reduced and pinned, which in the ED setting was irreducible. The trapezial fracture was well aligned (Figure 3). Intraoperative fluoroscopy: the trapezium fracture can now be well appreciated; images after closed reduction and percutaneous fixation of all three rays, showing anatomic reduction. A short arm thumb spica was placed and the wrist was immobilized for a month. The pins were then removed, the patient progressed to a removable wrist /thumb spica splint with therapy to restore motion and at 2 months was released to full activities. He resumed work and his hobbies. At 3 months his DASH score was 5.6; his main limitation was lack of wrist dorsiflexion, difficulty with pushups due to stiffness and pain with the end of range of motion. He graded his pain as 0 at rest and 3-4 with maximal dorsiflexion and was very satisfied with his short term outcome. Examination revealed 50 degrees of wrist extension and flexion. Follow-up radiographs demonstrated maintenance of the reduction, no joint space narrowing and healed trapezium fracture. This case presents a novel wrist injury and its subsequent management. We shall also review the pertinent literature and contrast it to the reported injury. The wrist distal to the radiocarpal joint contains 8 carpal bones, 5 metacarpals and multiple articulations, hence multiple injury variations are possible. Specific patterns are more frequent in the carpometacarpal area, namely 5th and 4th ray injuries. This is related to the increased mobility and decreased joint stability compared to the other rays, with the second CMC being the stiffest. Dorsal dislocation of the 2 nd and 3 rd CMC joints in association with trapezoid fracture, 2 nd metacarpal head fracture and fractures of the bases of the 4 th and 5 th metacarpals, as well as small finger proximal and middle phalanx fracture has been reported by Nano.8 There was a delay in surgery due to brain injury, hence open reduction and intraoperative use of an external fixator was necessary to effect reduction. Ostrowski reported a trapezoid dislocation with associated subluxation of the 2nd and 3rd CMC joints, no first ray injury was reported.9 A soft tissue repair, despite intraoperative stability through range of motion, was unsuccessful and necessitated repeat open reduction and limited intercarpal fusion with follow-up radiographs demonstrating STT narrowing. Broadbent reported an in-situ rotational dislocation of the trapezoid with 2 nd and 3 rd CMC instability.2 The rotational dislocation was not recognized preoperatively or intraoperatively during closed reduction and pinning. Postoperatively the trapezoid alignment did not appear anatomic. CT demonstrated the persistent trapezoid rotational dislocation and the patient returned to the OR for open reduction. Mestdagh7 reported 5 cases of STT dislocation and various associated injuries in each patient: 1: trapezium fracture; 2: 2 nd and 3 rd CMC dislocation, semicircular wrist laceration with partial ulnar neurovascular bundle injury and extensor tendon injury to index and long fingers; 3: wrist laceration at 2 nd metacarpal base with radial sided tendon injury, dislocation of 3 rd CMC and 4 th MC base fracture; 4: lacerations of thenar and hypothenar eminenences; 5: thenar eminence laceration and large dorsal degloving. All injuries were associated with violent mechanisms. Laing5 reported a case of trapezium and trapezoid dislocations along with 3 rd -5 th CMC dislocations. In the largest series with longest follow up on 20 CMC dislocations by Lawlis no first ray injuries were reported.6 Interestingly, 3 of 4 patients with isolated 2 nd and 3 rd CMC injuries had worse outcomes than patients with 2 nd -5 th CMC injuries. The treatment was open reduction and internal fixation, whereas in most other smaller series and case reports the injuries are closed reduced and pinned. Open reduction was required for cases where closed reduction was impossible or non-anatomic. Thumb CMC dislocation is a rare injury and the largest comparative treatment series by Simonian11 recommended early ligament reconstruction instead of closed reduction/internal fixation. There are, however, reports of successful closed reduction/percutaneous fixation. In a small case series of athletes closed treatment without any fixation was successful12 highlighting the controversy for this particular injury. In this review we identified multiple variations of injury in the carpometacarpal area such as multiple CMC dislocation plus trapezium fractures, trapezium and/or trapezoid dislocation but dislocation of the thumb CMC in association with other CMC dislocations is hereto unreported. Due to space constraints we did not include the full list of articles reviewed, just the ones that were more relevant. In conclusion, we described a novel carpometacarpal injury pattern of the 1 st through 3 rd rays with a thumb CMC dislocation, minimally displaced trapezium fracture, trapezoid dislocation and 3 rd CMC dislocation. The injury was promptly identified and correctly characterized. Anatomic reduction and internal fixation for an appropriate time period allowed for soft tissue healing and a good short term outcome. Despite initiation of motion at 4 weeks, the patient was still bothered by wrist stiffness at 3 months, albeit with a functional arc.